Did you know that every shipment that arrives into the United States by sea is documented on the public record? Every container, every boat and every product imported into the US can be easily accessed if you know where to look. 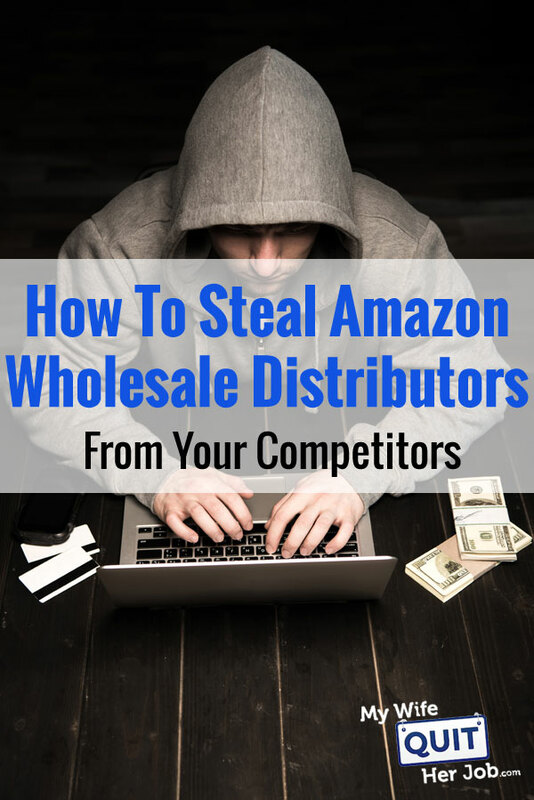 Find Out Which Amazon Wholesale Distributors Your Competitors Are Using – Because all container contents and import data is clearly documented, you can look up all of your competitor’s sea shipments and discover exactly who their suppliers are. Negotiate Better Pricing With Your Current Suppliers – Are you worried that your supplier is selling your proprietary products to the competition? You can easily discover who else your supplier is currently working with and use this data to negotiate better pricing and terms. Locate New Reliable Suppliers – Alibaba is rife with middlemen and trading companies. With access to the US import database, you can instantly find reliable suppliers without sifting through hundreds of listings. In this post, I’m going to show you an inexpensive way to access the US import and trade database and use this data to your advantage. Every shipping container that enters a US port must go through customs before it is allowed to enter the United States. And as part of the customs process, every aspect of the shipment is carefully documented. For example, here is a sample bill of lading for The North Face(One of my favorite outdoor products companies). 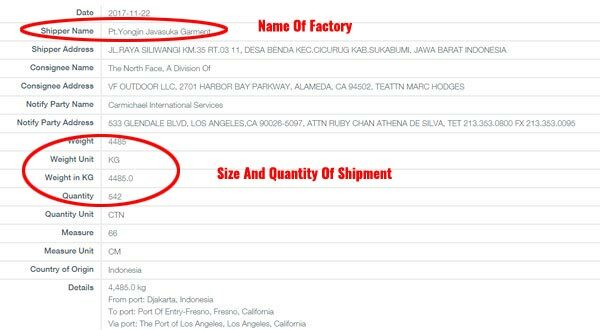 As you can see, the factory North Face uses to produce their jackets is clearly indicated on the bill of lading along with the size and weight of the shipment. With this information, you can easily reach out to the exact same factory and have your goods made there as well. While all of the US Trade and Tariff data can be obtained from the US government website, it is generally not formatted for public consumption. Now there are companies out there like Panjiva and Import Genius who will parse and collate the US import database for you. But these service come at a fairly high cost. If you’re currently selling on Amazon, chances are that you already own the Jungle Scout web app and now, it’s even more powerful! 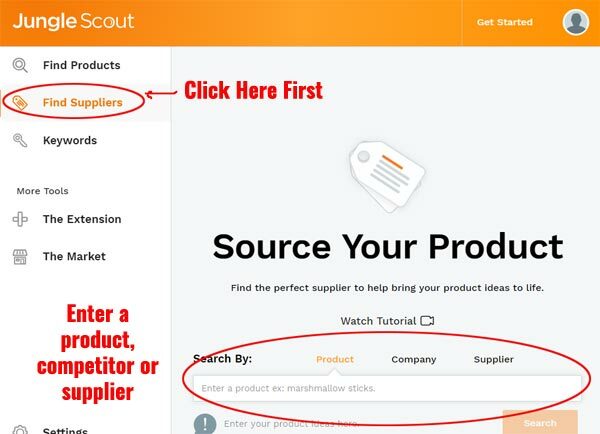 The remainder of this tutorial will focus on how to use the Jungle Scout web app to find your competitor’s distributors, suppliers and factories. 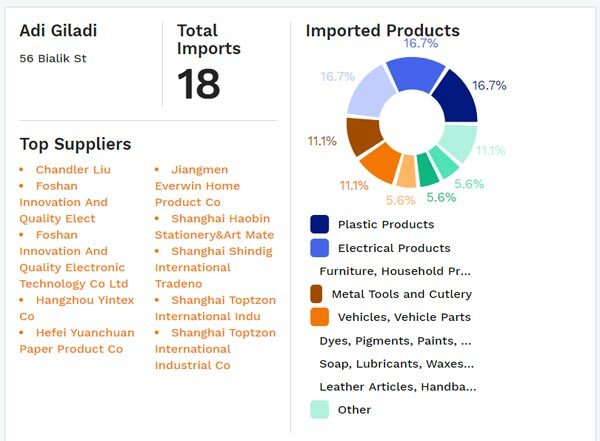 When you first login to the Jungle Scout web app, you’ll want to click on the tab labeled “Find Suppliers”. 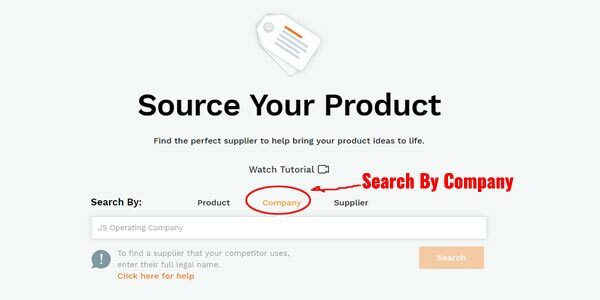 For this section of the tutorial, we are going to focus on finding your competitor’s suppliers, so click on “Company”. From here, type in the name of the company that you would like to search for. Here’s an example of a search conducted with The North Face. 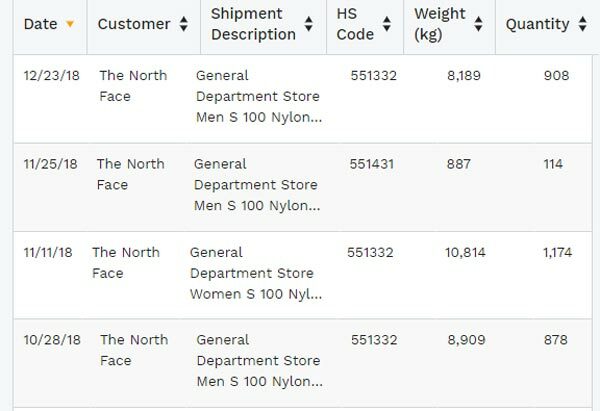 A simple search reveals the factories that The North Face is working with along with their shipment volume. 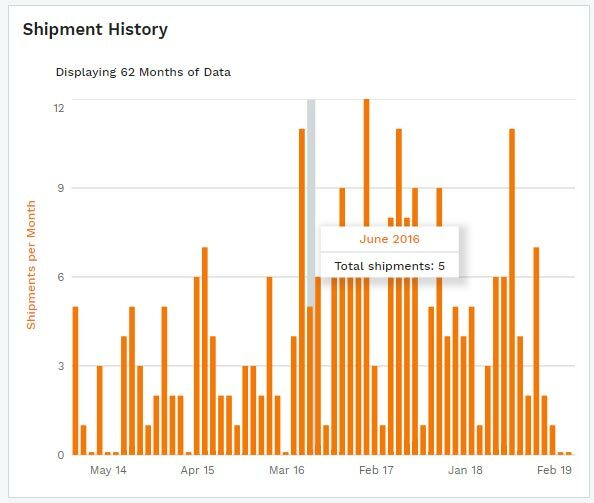 By clicking on any of the factory links displayed on this page, you can obtain more in depth data about container contents, weight and frequency. These reports are extremely detailed. By piecing together the contents of each shipping container along with the quantity and weight, you can easily figure out how much volume the company sells of each product. In addition, you reach out to these exact same factories to produce your own products if they are similar in nature to the products they sell. 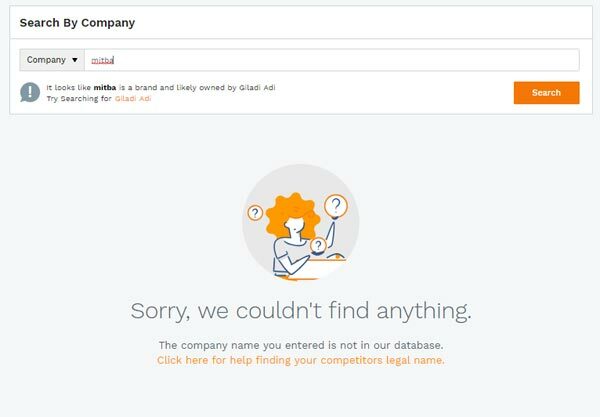 While the Jungle Scout supplier tool is extremely powerful, the one downside is that it can be difficult to find your competitor in their database unless you know the exact legal name of the company you are searching for. The example I presented above was for the North Face, which is an extremely large and well known company. But most private label brands are small and obscure so how can you apply this to your Amazon competition? The solution involves some legwork. First off, you need to find the brand you are trying to research. In this example, I typed in “Mitba” into Jungle Scout and here’s what I obtained. As you can see, Jungle Scout returns a big goose egg. There are no companies named “Mitba” in the US import database. As a result, finding this company’s suppliers requires some additional research. Note: Sometimes Jungle Scout can infer the legal name for the brand. But in case it can not, you must follow the instructions below. Now we know that any serious brand on Amazon is probably registered with the Amazon Brand Registry which requires a trademark. You can also tell if a brand is registered if they are using enhanced brand content or headline ads with their listing. Once you’ve determined that your competitor’s brand is registered on Amazon, you’ll want to conduct a trademark search. Personally, I like to use the free tool Justia to conduct my searches. 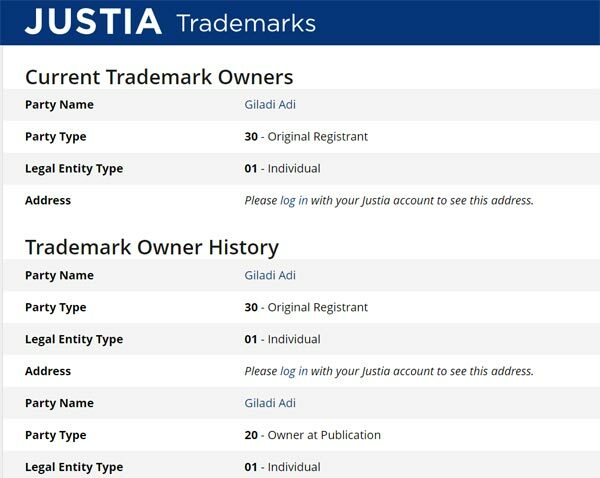 If you click on the listing, you’ll find all of the details of the trademark including the legal entity that registered it. From here, I enter in all of the legal entity names into Jungle Scout until I get a match. As you can see, we have a hit! 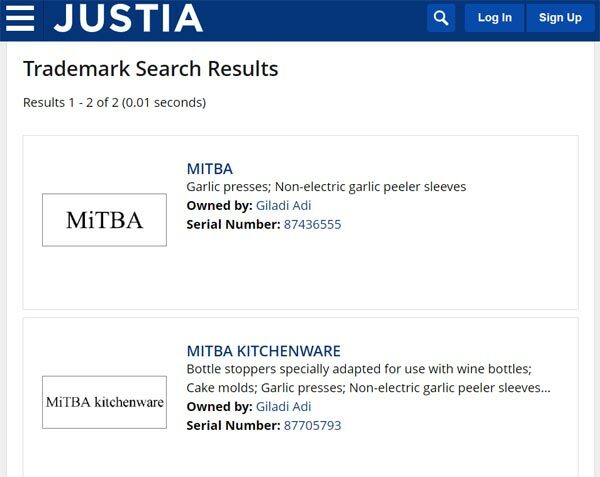 And we now know exactly where Mitba buys their garlic presses from. One of the biggest disadvantages of using Alibaba to find suppliers online is that you have to weed through a multitude of middlemen and trading companies on the platform. Even if you filter by gold and assessed suppliers, it does not mean that you will end up with a high quality supplier let alone an experienced one. 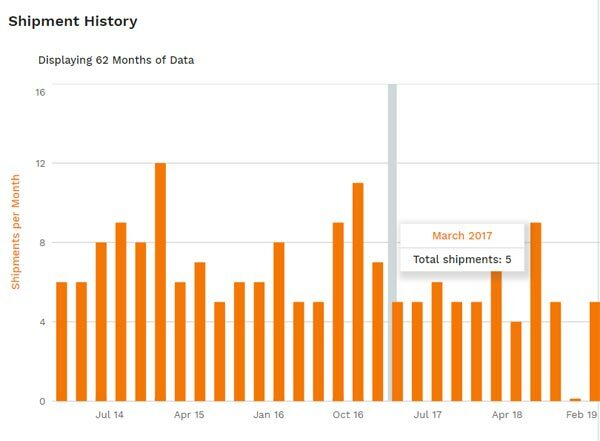 A great way to find a reputable supplier right off the bat is by looking up a supplier’s prior shipment history. Does The Supplier Ship To Your Country? – If you are based in the United States and the supplier you are researching has never made a shipment to the US before, then that’s a bad sign. How Established Is The Supplier? 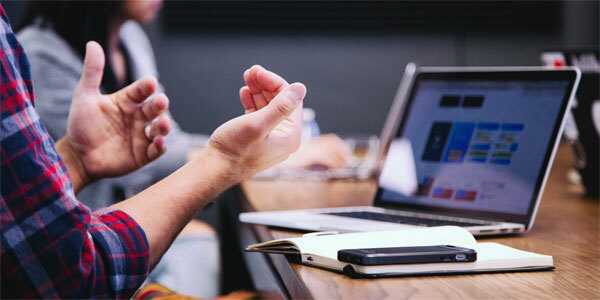 – If the supplier only has a few customers or makes very few shipments, then that’s generally a sign that the vendor is small, new or inexperienced. Can The Supplier Ship In High Volume? – If you require a factory that can produce thousands of units per month, you’ll want to know whether the factory has the capacity to meet your production needs. Does The Supplier Work With Reputable Companies? – If the factory works with larger brands like Walmart, Home Depot, Target etc…, then that’s generally a good sign that the supplier is reliable. 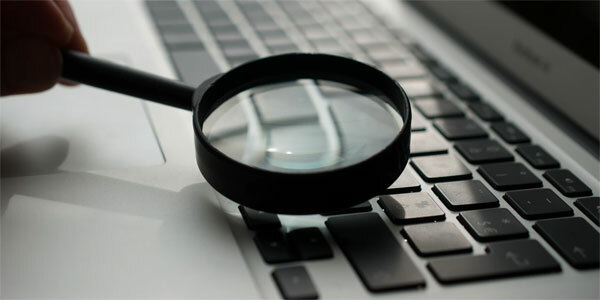 To perform a supplier search, simply type in the product you are looking for into the Jungle Scout web app. In the example above, I typed in “garlic press” into the search box and instantly found a variety of factories that produce them for popular brands on the Internet. For example, “Good Things International” works with well known companies like “Sur La Table” and “Dixon Ticonderoga” which indicates that they can produce high quality products in mass quantities. 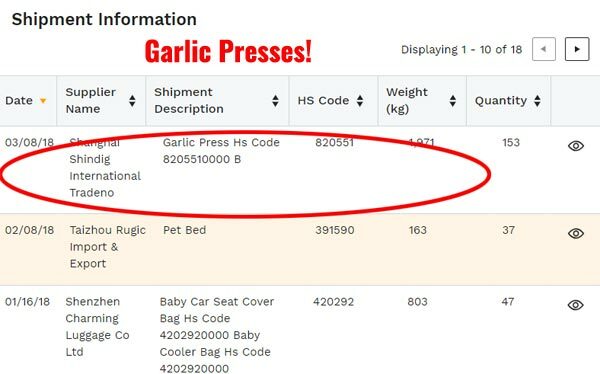 If you want to sell garlic presses, it makes sense to reach out to this company. Once you know you want to work with a specific supplier, simply click on the “search for supplier info” button which will lead you to Google where you can contact them directly. 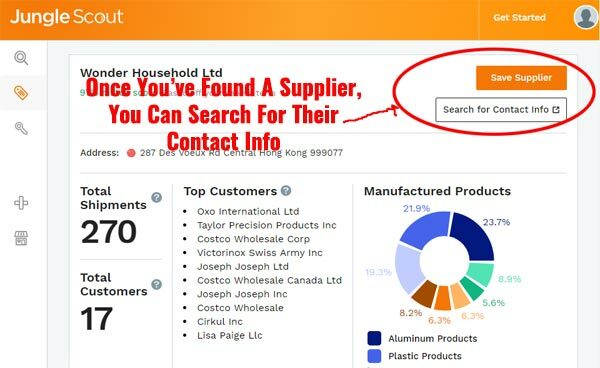 Alternatively, you can perform a search on Alibaba to see if you can find additional information about your supplier. 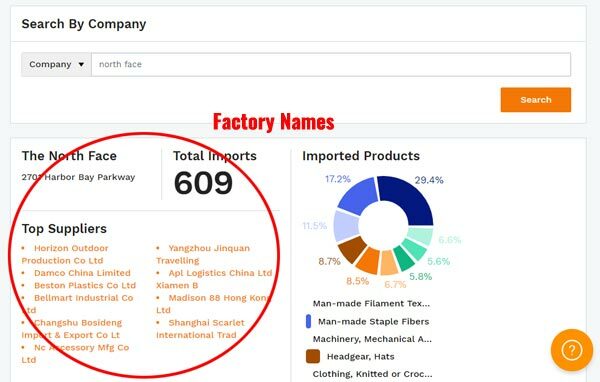 Editor’s Note: Most of the larger, more established factories can not be found on Alibaba. 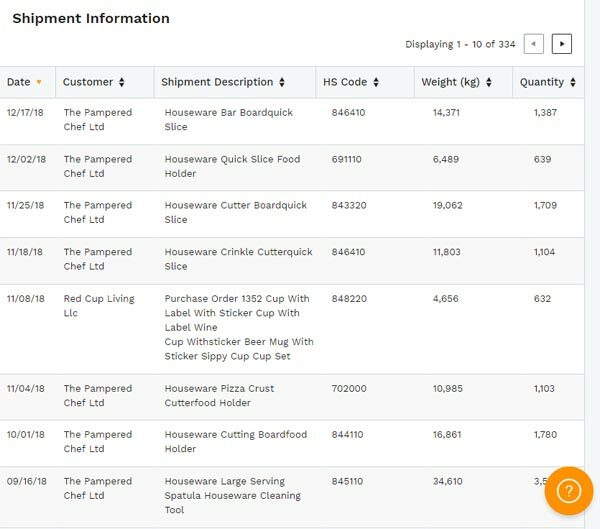 Once you have a potential supplier in mind, you can use Jungle Scout to view their shipment history. 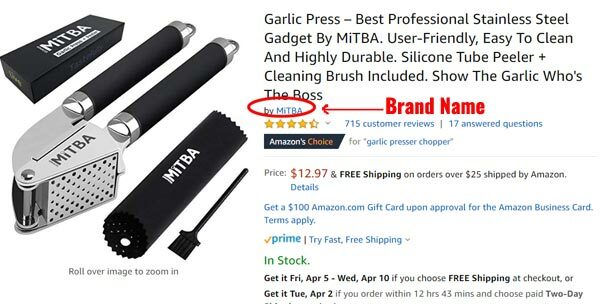 Using the garlic press example above, let’s take a closer look at what “Good Things International” makes for their customers. As you can see, Good Things International makes quite a few shipments to major retailers across the United States. As a result, you should feel very comfortable working with them. However because they ship in such large volumes, they likely have extremely high MOQs or minimum order quantities. If you’re just starting out, then this factory will probably be a no go. Basically, when you are looking for reputable vendors to work with, you’ll want to do your own due diligence and check out their existing customers. In fact, I would probably go on Amazon, find a product this supplier has produced and make a purchase. By having a sample product in hand, you can gauge quality and decide whether you want to work with a vendor before even contacting them! One of the benefits of having the US import data at your disposal is that you can see all of the customers that a given supplier works with. As a result, you can run a quick search for the suppliers and distributors that you are currently using to source products to sell online. Why bother researching your existing suppliers? Because you can use this data to negotiate better pricing for your goods. If you found your supplier on Alibaba, there’s a good chance that it’s a smaller factory. Now this isn’t always true, but I’ve found that most major suppliers do not list themselves on Alibaba because they don’t want to deal with smaller, newbie sellers. For our ecommerce store, most of our vendors can not be found on Alibaba and we typically find new vendors at tradeshows or through sourcing agents. 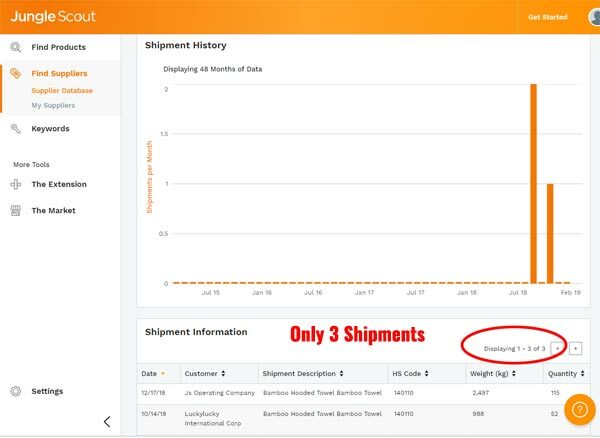 In any case, you should perform a supplier search on Jungle Scout and get an idea of how your shipping volumes compare to their other customers. Just for fun, I looked up one of Jungle Scout’s suppliers for their Jungle Snugs product and found that one of their suppliers only made 3 shipments in the past year. Not only that but Jungle Scout seems to be their largest customer! Now I don’t know the exact details regarding the arrangement that Jungle Scout has with this manufacturer or whether there is some data missing from the graph. However if Jungle Scout is indeed their largest customer, then they should be able to negotiate more favorable pricing terms. Bottom line, you can use this data to your advantage in negotiations if you are a major customer for your supplier. Access to the US import and trade database used to be expensive. But thanks to Jungle Scout, all of this information is now included for free as part of the Jungle Scout Webapp. It’s a no brainer to sign up! However having access to all of this data is a double edged sword. On one hand, you can find out where practically every company is sourcing their products from. But on the other hand, everyone can now find out who YOU are working with as well. As a result, it’s more important than ever to establish a strong brand for your products. With all of this information becoming commoditized, your success in ecommerce will come down to a handful of factors. 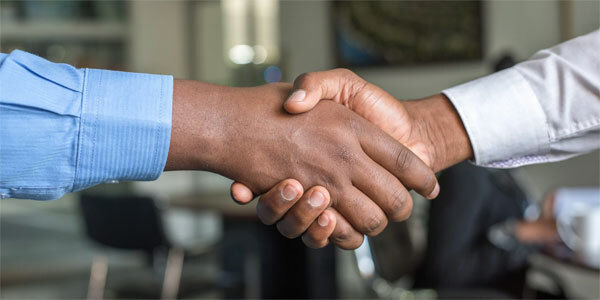 Your Relationship With Your Supplier – By becoming friends with your suppliers, you’ll be able to negotiate better terms and discounts that brand new sellers will not be able to access. Your relationship with your vendor is everything! Your Ability To Build A Brand – Building a brand almost always requires producing content of some kind. Whether it be blog posts, videos or images, you have to start building an audience. Your Ability To Build An Email/Messenger List – Ultimately, you need to learn how to drive traffic to your own products and retain your customers through email and messenger. Customers are fickle. Your Ability To Get Repeat Business – A customer who has purchased from you once is 60% more likely to buy from you again. You have to leverage your existing customers to build a solid foundation for growth. Bottom line, the ecommerce game is constantly evolving. In the beginning, it was all about technology. Whoever could put up a good looking website had the upper hand but fully hosted platforms like BigCommerce and Shopify changed the game. Back in the day, it was also extremely difficult to find Asian suppliers as well but Alibaba changed everything. 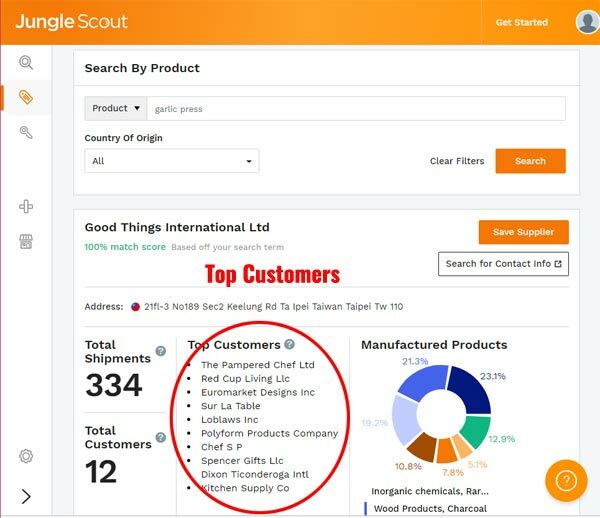 And now thanks to Jungle Scout, you can literally spy on your competition and find out their sales data, their suppliers, their product portfolio…EVERYTHING! If you want to be successful selling online today, you have to learn how to market your business effectively and build a brand.